The Deestone D413 rear traction tires are engineered to deliver grip on wet and soft soil. They feature angled tread bars for self-cleaning capability and traction. The optimized lug spacing and shape enhances surface contact to improve as well as stability. A strong nylon casing combines with tough lugs to improve endurance and resistance to wear. 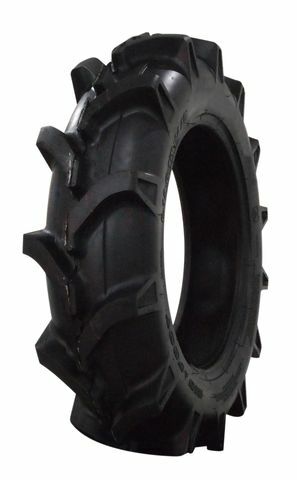 The tires are made of rubber compounds that last long and perform reliably in field conditions. 5/--12 N/A 0 lbs 0 psi 0/32nds N/A 0" N/A 0"
Purchase includes the Deestone D413 tire only. The wheel rim shown in the picture is not included. Picture provided is a stock picture from the manufacturer and may or may not reflect the actual product being ordered. All Deestone D413 tires are continuously developing with manufactured improvements. With that said, Simple Tire and the manufacturers have the right to change these tire specifications at any time without notice or obligation. Please Note: Specifications of the Deestone D413 tires shown above are listed to be as accurate as possible based on the information provided to us by Deestone tires. The above ratings really do not apply to the tire I bought. The tire I bought was a front wheel tire for a 4 wheel drive, L3000 Kubota tractor...mounted nicely and gives the traction I desire from my farm tractor. Have not used the tractor that much however, since purchase. i was impressed with SimpleTire, their specs on the tire, their price beat any others and their shipping, was superb. I got my tire the very next day after ordering and was impressed! I was so impressed I may just go ahead and replace the other front tire, just due to age on the remaining tire...I have absolutely no hesitation doing business with the folks at SimpleTire. These are perfect tires for the front of my compact tractor. Great traction, great price, and free shipping which was quick. By submitting a review, each person received a sweepstakes entry. i bought these for my farm tractor 's front tires and they have been great and they were the best price i could find anywhere By submitting a review, each person received a sweepstakes entry.